NASA's legendary Kepler space telescope has retired after running out of fuel needed for further science operations, bringing an end to a prolific nine-and-a-half year mission in which it discovered over 2,600 intriguing exoplanets, some of which may harbour life, the United States space agency said. Data collected from Kepler's deep space missions indicates our sky is filled with billions of hidden planets -- more than the stars, NASA said in a statement. The unmanned space telescope, which launched in 2009, leaves a legacy of more than 2,600 planet discoveries from outside our solar system, many of which could be promising places for life, the US space agency said. "As NASA's first planet-hunting mission, Kepler has wildly exceeded all our expectations and paved the way for our exploration and search for life in the solar system and beyond," said Thomas Zurbuchen, associate administrator of NASA's Science Mission Directorate. "Not only did it show us how many planets could be out there, it sparked an entirely new and robust field of research that has taken the science community by storm," Zurbuchen said. "Its discoveries have shed a new light on our place in the universe, and illuminated the tantalising mysteries and possibilities among the stars," he said. Kepler has opened our eyes to the diversity of planets that exist in our galaxy, mission scientists said. The most recent analysis of Kepler's discoveries concludes that 20 to 50 per cent of the stars visible in the night sky are likely to have small, possibly rocky, planets similar in size to Earth, and located within the habitable zone of their parent stars. That means they are located at distances from their parent stars where liquid water -- a vital ingredient to life as we know it -- might pool on the planet surface, NASA said. The most common size of planet Kepler found doesn't exist in our solar system -- a world between the size of Earth and Neptune - and we have much to learn about these planets, according to the US space agency. Kepler also found nature often produces jam-packed planetary systems, in some cases with so many planets orbiting close to their parent stars that our own inner solar system looks sparse by comparison. "When we started conceiving this mission 35 years ago, we didn't know of a single planet outside our solar system," said the Kepler mission's founding principal investigator, William Borucki, now retired from NASA's Ames Research Center. "Now that we know planets are everywhere, Kepler has set us on a new course that's full of promise for future generations to explore our galaxy," Borucki said. Launched on March 6, 2009, the Kepler space telescope combined cutting-edge techniques in measuring stellar brightness with the largest digital camera outfitted for outer space observations at that time. Originally positioned to stare continuously at 150,000 stars in one star-studded patch of the sky in the constellation Cygnus, Kepler took the first survey of planets in our galaxy and became the agency's first mission to detect Earth-size planets in the habitable zones of their stars. "The Kepler mission was based on a very innovative design. 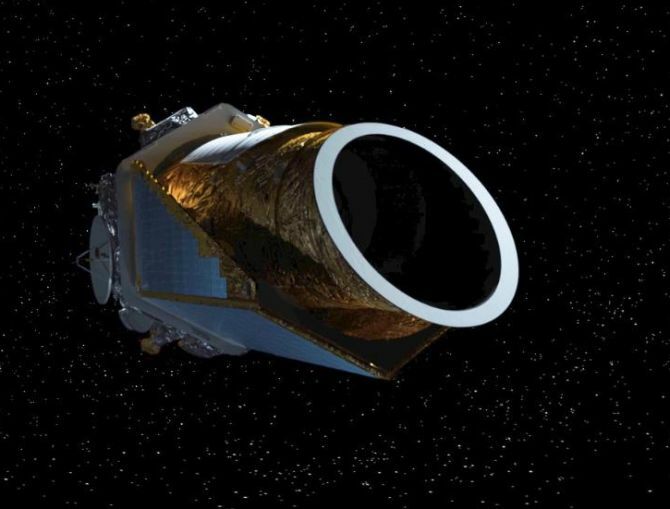 It was an extremely clever approach to doing this kind of science," said Leslie Livesay, director for astronomy and physics at NASA's Jet Propulsion Laboratory, who served as Kepler project manager during mission development. "There were definitely challenges, but Kepler had an extremely talented team of scientists and engineers who overcame them," Livesay said. Four years into the mission, after the primary mission objectives had been met, mechanical failures temporarily halted observations. The mission team was able to devise a fix, switching the spacecraft's field of view roughly every three months. The observation of so many stars has allowed scientists to better understand stellar behaviours and properties, which is critical information in studying the planets that orbit them. New research into stars with Kepler data also is furthering other areas of astronomy, such as the history of our Milky Way galaxy and the beginning stages of exploding stars called supernovae that are used to study how fast the universe is expanding, NASA said. The data from the extended mission were also made available to the public and science community immediately, allowing discoveries to be made at an incredible pace and setting a high bar for other missions. Scientists are expected to spend a decade or more in search of new discoveries in the treasure trove of data Kepler provided. "We know the spacecraft's retirement isn't the end of Kepler's discoveries," said Jessie Dotson, Kepler's project scientist at NASA's Ames Research Center. The latest data, from Campaign 19, will complement the data from NASA's newest planet hunter, the Transiting Exoplanet Survey Satellite, launched in April. TESS builds on Kepler's foundation with fresh batches of data in its search of planets orbiting some 200,000 of the brightest and nearest stars to the Earth, worlds that can later be explored for signs of life by missions such as NASA's James Webb Space Telescope. NASA's Spitzer telescope @ 10: Gems from the universe!